← Málaga´s Botanical Gardens: Can you dig it? Around many parts of Spain, you will see the famous Osborne Bull (Toro de Osborne) silhouetted against the impossibly blue sky. The 14 metre high black image of a bull in semi-profile, has come to be regarded as the unofficial national symbol of Spain. First created in 1956 and erected close to major roads by the Osborne Sherry Company to advertise their Brandy de Jerez, the bulls used to feature the brand name “Veterano” in red, emblazoned across them. In 1994, a law in Spain was passed which prohibited roadside advertising which meant that the hoardings would have to be removed. However, there was a public outcry as the bulls had become much loved, so in order to comply with the law, the bulls were completely blacked out to remove all reference to the original advertisers. Only two bulls remain in Spain with the word “Osborne” still written on them. One is at the airport of Jerez de la Frontera in Cadiz province, and the other is in the nearby town of El Puerto de Santa María, where the headquarters of the Osborne company can be found. 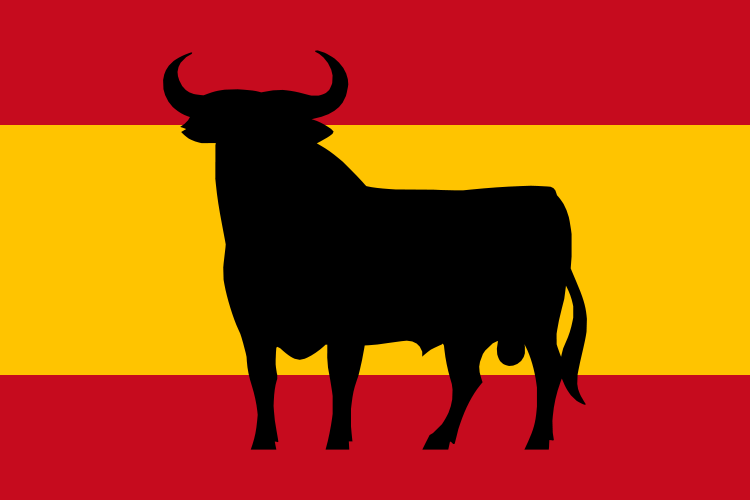 The image of the bull is now proudly displayed in stickers, key rings and memorabilia throughout Spain, and at sports events where a Spanish team or individual take part, the bull is embedded by supporters into the Spanish flag in the manner of a coat of arms. 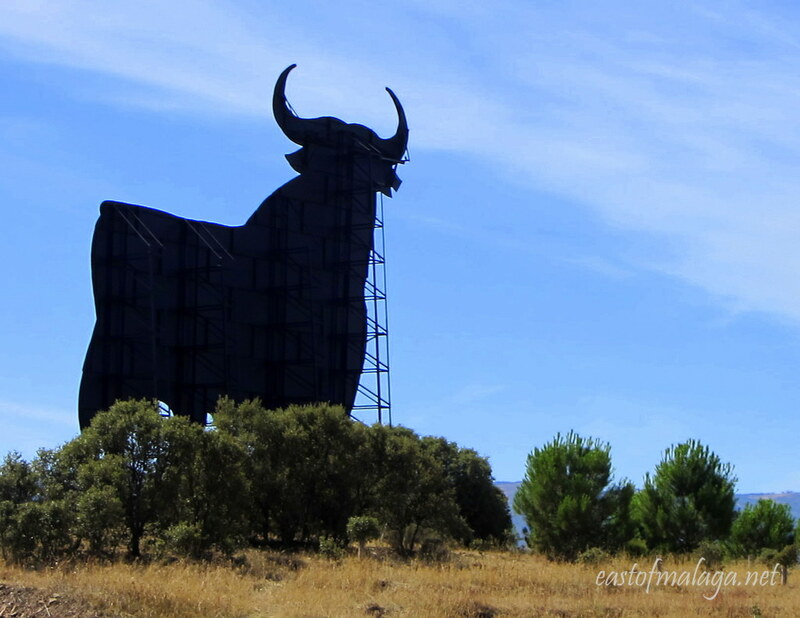 There are 23 of these bulls to be found within the region of Andalucía – so keep your eyes peeled on your travels! This entry was tagged Andalucía, culture, customs, East of Malaga, Europe, history, Malaga, photography, Weekly Photo challenge. Bookmark the permalink. Me too, Jo – I love them! The perfect silhouette! Have seen a couple on our trip to Andalusia. Fantastic pic for the challenge – I absolutely love it! great info and interesting entry for the challenge …. Glad you enjoyed it, Isadora. I love seeing them to and when we drive past the one in Casabermeja I feel happy as I know I am only about 25 minutes from home! I’ve been to Osborne on one of my stops in El Puerto di Santa Maria. I love their brandy, one of my favorites and I would take it over French cognac any old day. That whole area, from Cadiz to Sanlúcar de Barrameda, is where I’d really like to be. Great response to the challenge! I remember The Bull, though we had to ask someone about it’s meaning. Still, they are truly something to see. It´s funny, whenever we are driving along and see one, we always point and remark about it. You would think we would be used to them by now! They are much better like this though than in bull-fighting, aren´t they? Yes! Guernica made a better use of the image of the bull, than bull fighting does of bulls…. So cool – the perfect silhouette! AWESOME! AWESOME! AWESOME! I know this roadside advertisement. I didn’t know anything about it though. It’s very recognizable going to Jerez. I was in Jerez where I got rammed by a bull, and when I visited a bodega. AWESOME post, thank you, thank you for the share. It’s nice to read some story behind an image. OOHHH rammed by a bull? Hope you didn´t get hurt, Rommel! The bodega tours are great, aren´t they? Seen a couple on my travels but you’ve just made me realise what a good “silhouette” the Sandemans figure makes, in a similar vein. I meant to look up his history but haven’t got around to it yet. That´s right, Jo, and don´t forget about the Tio Pepe figure (which is red and black) with the hat, bolero and guitar! I knew I wouldn’t be the only one who thought of this iconic silhouette! It just had to be done Jeni! It is kind of Spain’s symbol after all, it is a good thing that these silhouettes remained as a part of the landscape. I think that was why there was such an outcry when the law banned them from advertising. People loved them. It IS a good thing that they remained. Yeah I saw quite a few during the field trips I took when I was studying abroad in Malaga. I think Andalucia has the most bulls. I knew the bulls had been part of an ad campaign for some kind of alcohol. It’s interesting to me how many people are actually unaware of that! Characteristic silhouettes, Spain and bulls belong together. In the wild way, or like this. Not in the arena-way! I like the history of bull fights and the bull arenas — but for the animals it isn’t good.